First thing first, I'm not the kind of girl whose obsessed with being stylish 24/7. I don't wear high heels all the time. In fact, I only wear them in front of the camera. Another fact about me, I often wear wrong costumes to party. But being wrong costumed is definitely better than looking dulled in a party. I understand that sometimes, traffics are just so ridiculous that you got no time to go home first before attending a Friday night event. And sometimes, you just have to change your working outfit to a more proper outfit at the public toilet. Or in your car. But being smelled nice should be your 24/7 job. And I'm obsessed with people who smells nice. Not that you're going to meet me now for that matter. But let's agree that nobody likes horrible smells. For that situation, I always bring a body spray with me. 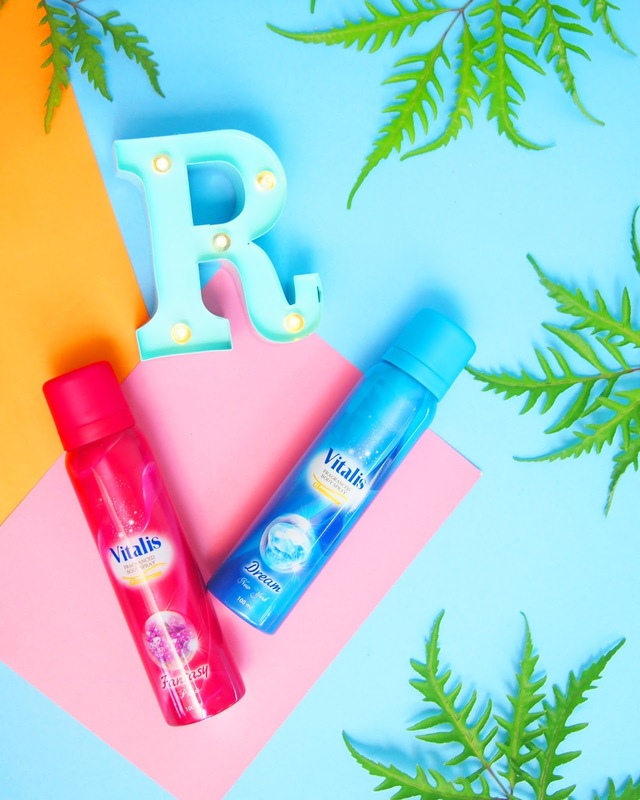 Most people don't know the difference between body spray and perfume. But there's a bit difference between them. Body spray is lighter than perfume. Possibly because body spray has the direct contact with your body (skin). On the other hand, perfume may not have direct contact with your body. 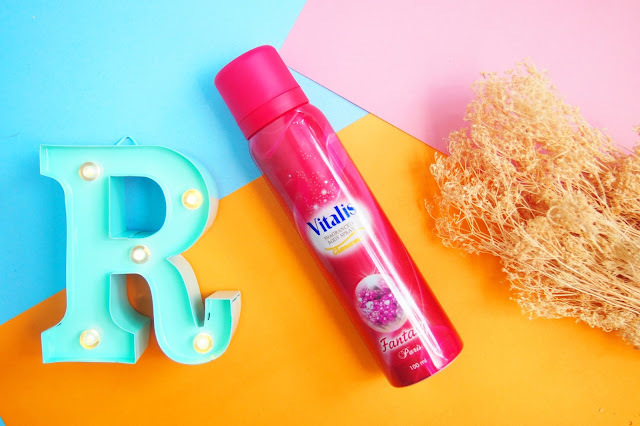 Therefore, body spray brings about freshness to your body, whereas perfume brings about fragrance to your clothes or place. This time, I'm going to review this affordable body spray product that I got a few days ago. 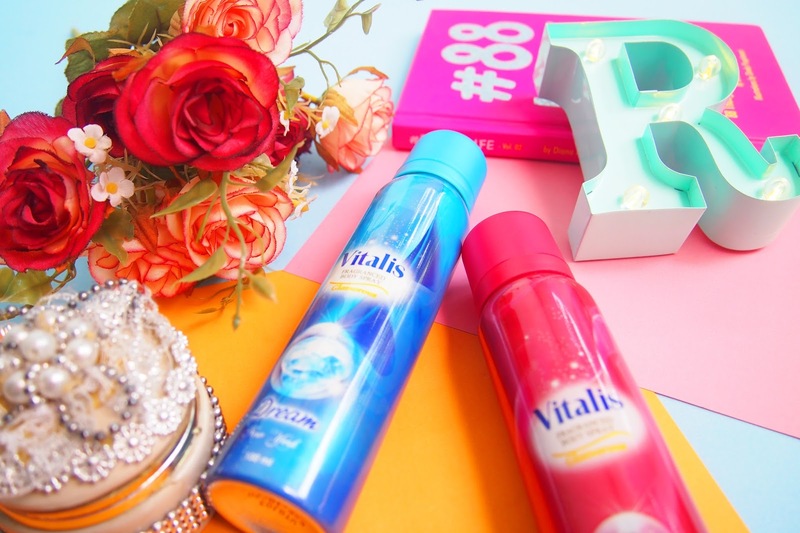 Which is Vitalis Glamorous Fragranced Body Spray. They have three variants of this body spray. Fantasy, Dream, and Sheer. But I will only review two of them, Fantasy and Dream. The body spray comes in regular can spray bottle like most other body sprays available in the market but it also looks luxurious. The bottle is slim enough to fit in my bag without needing a lot of space. Every bottle contains 100ml of the body spray so it's pretty light weighted too. Personally, I love the Dream variant more. It's a mixture of orange, flower, and musky. Super sweet. And it reminds me of my father's after shower smell. But if you like something softer, you might like the Fantasy variant more. Which is a mixture of floral powdery and soft musky. The smell lasts up to 4-5 hours in normal activities. But if you don't really do any strenuous activity, it might last more than 6 hours. I also tried to spray this to my body before I go to sleep (like I said, being smelled nice is 24/7 job) and the smell still lingering on my skin when I woke up in the morning. 1) It smells pleasant. The scent is so glamorous and attracts admiration from other people. Like seriously, who doesn't admire well-smelled stylish person? It also has this effect to make you feel more confident, fresh, and glamor in the party or event you're going to attend. So it's good for everyday use. 2) Affordable price. You can find it at your local minimarket nearby so it's pretty easy to find. 3) The body spray contains alcohol but it doesn't make your skin dry. To intensify the scent as the day goes on, use after shower and spray on the pulse point. Such as behind the neck and ears, on wrists, or inside elbows. You can also put lotion or spray perfume with similar scent. 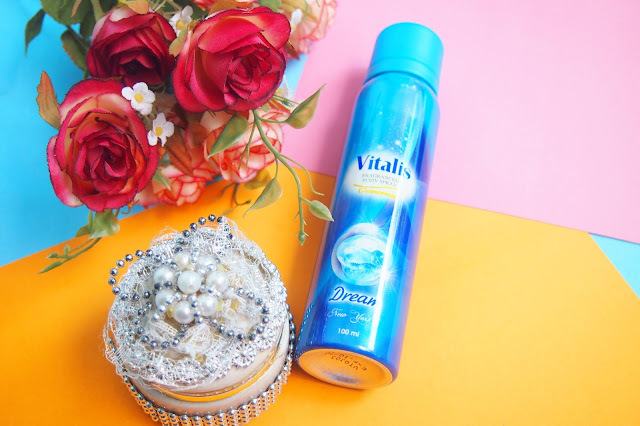 Vitalis Glamorous Fragranced Body Spray also comes in perfume version. Which has the stronger smell than the body spray. Thanks for following my blog, I just followed you back. Hello now I am following you on FB too!! This spray seems so nice, thanks for reviewing!